But the ocean has gotten under my skin, and all I want to do is swim in it or dive to the bottom of it or float on it or watch it…so when a newsletter from the Bermuda Aquarium advertised the Skiller Sargasso Sea Adult Voyage I thought to myself, “We should do it.” That is why, on Monday, August 27th, Richard and I boarded the tall ship, Spirit of Bermuda, to embark on a five-day voyage to the open ocean, sailing as far as 100 miles south of the island. The purpose of the expedition, in addition to learning about sailing and ship handling, was to observe bird and fish populations and analyze Sargassum mats. On board we had the captain, a sailing crew of seven, two scientists and an assistant, and ten “trainee” participants including the two us. The journey certainly had its challenges, but it was an incredible and inspiring experience. When we returned to Dockyards five days later, I was reluctant to disembark, having gained a renewed appreciation for the power of the sea and the life within it. What follows is a condensed version of the journal I kept for those five days aboard ship. 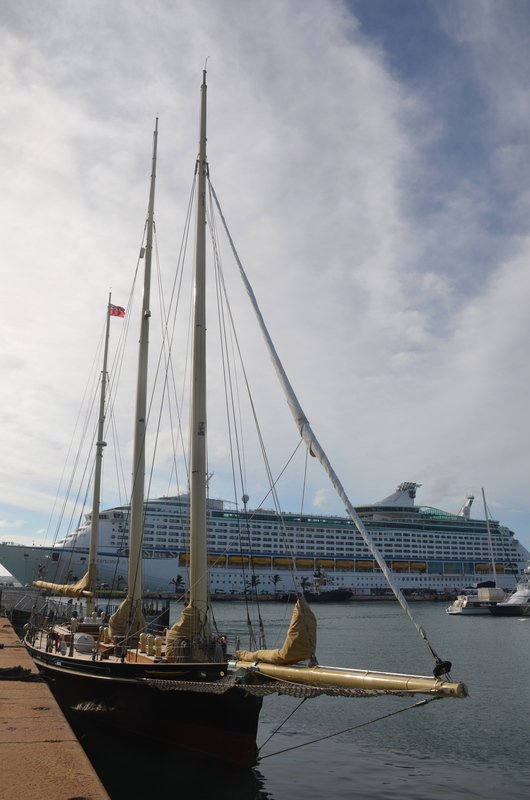 Day 1: With great excitement, we walked toward the Spirit of Bermuda where she was tied to the dock at Dockyards, her tall masts towering to the sky. Were we really going to be living on this beautiful ship for five days? Questions crowded my head: How big were the berths below? What were those two big white plastic drums bolted to the deck? What would it feel like to be out on the open water with the wind billowing the sails? Would I get seasick? All members of the expedition were gathered together in the Dockyard gazebo so we could introduce ourselves and meet the crew. Then we tossed our belongings onto the ship and boarded. Second Officer Mario began briefing us as the engines were started and we made our way to St. George’s harbour. We were given safety instructions, and as we cruised along the North Shore (where Richard and I looked up to find our house), we ran drills–man overboard, a fire drill, and an abandon ship muster. With all these things that could go wrong, I began to feel a tad apprehensive. By the way, those two big white drums bolted to the deck contained life rafts. We were assigned our bunks and our watch crew. Richard and I were on the 12-4 watch, where we’d have to be on deck from noon till four and midnight till four, having the rest of the day/night free to participate in activities or sleep. I was dismayed to find that our bunks were in the galley, right by the kitchen and dining tables, and not in the more comfortable looking berth room. However, we were encouraged when someone told us that the middle of the ship has the least amount of movement, so in actuality it was the better place to have a bunk. In St. George, while supplies and the cook were brought on board, we trainees were taught how to prepare for sailing. I learned how to put the battens in the sails, the difference between halliard ropes and sheet ropes, and what a winch was for. At 3:00, we gathered with our watch crews to hoist the sails. Two-six-HEAVE! What a magnificent feeling as we sailed away from Bermuda, all five sails billowing in the wind, riding the swells in silence. One of the trainees became extremely seasick as soon as we hit the swells, and he took up residence at the rails. The rest of us had lunch, familiarized ourselves with the ship, and Richard and I took a nap to prepare for having to get up at midnight for our watch. We were awakened at 11:30, and roused ourselves, being sure to don our harnesses, combination harness and inflatable life jacket with which we could attach ourselves to a guide strap the length of the boat. We were required to wear these whenever we were on deck at night or in inclement weather. The night was quiet and surprisingly bright with the glow of the moon. Our watch leader, First Officer Dave told us that we were on our way back to St. George because the trainee who was so seasick had put in a request to go home. As part of our watch duties, Dave led us around the ship inspecting the ropes and the sails, and we took turns with the rest of our watch crew at the bow watch. Poor Richard was hit with seasickness, and tried hard to stay alert during our watch. I felt fine, and as tired as I was (I am so not a night person!) it was glorious to watch the moon reflected on the water, and the profusion of stars in the sky. I witnessed numerous shooting stars. When my watch was over, I headed back to bed and did not waken until we had been to St. George and sailed back out again. Day 2: About 90 miles south of Bermuda, we came upon several Sargassum mats, and under the direction of Dr. Robbie, we took turns scooping it up in nets and then sorting through it to find creatures that inhabit the weed. We found tiny shrimp, and little crabs and minute snails. One of the participants found a small Sargassum fish. Dr. Wingate had us all looking in the sky as well, for migrating birds, and we spotted a couple of longtails so far from land. And then, the excitement of the day, we spotted whales! All of us were entertained for close to a half hour by a pod of seven to nine sperm whales. What an experience that was! Several people on the ship were seasick and spending much of their time lying on their bunks, including the engineer and the cook! Richard was up and down, and another participant was not only seasick but suffering a severe asthma attack and needed medical attention, so once again we headed back to St. George. Richard, sweetheart that he is, got up for our midnight shift even though he wasn’t feeling a hundred per cent, and let me sleep. Day 3: When I awoke, we were motoring fast out to sea again, having returned the sick participant to shore. Richard filled me in on the events of the night, which involved the patient being transferred to a pilot ship just outside of St. George. But it was not a smooth transfer, as the pilot boat hit the side of Spirit, causing a delay of several hours more. The water was VERY swelly today, and conditions were not conducive to gathering Sargassum weed, or trawling for plankton, or even fishing. Dr. Robbie commented that we were “going nowhere fast.” And while were under engine power, the ship swayed side to side, exacerbating people’s seasickness. Once the sails went up, it steadied somewhat. But the day was sunny and glorious regardless, and I loved the feel of riding the swell (unlike most of the unfortunates who were down in their bunks feeling sick). I saw a multitude of flying fish, and witnessed a longtail swoop down and dive in the water, something I had not seen them do while they mated and nested on the island. When it came time for dinner, our cook, Trevor, pulled out chicken left over from the previous night, and put a pot of rice to cook on the stove, and then said to me, “That’s it, I’m too sick to do more.” So I went into the galley and pulled out onions, peppers, mushrooms and broccoli and chopped them and cooked a stirfy to accompany the chicken and rice. Preparing food in a swaying kitchen was an interesting challenge, but it was fun and I felt at home preparing food. After dinner a few of us played cards. Jose taught us a new game called Palace, and we novices beat him a few times. That night, while we were in our bunks, we sailed into a storm with rain and gale force winds up to 50 knots. Below deck we all rolled about, trying not to fall out of our beds, tensing muscles to stay put. We didn’t venture on deck for our watch that night, leaving the handling of the ship to the experts! Day 4: In the morning the winds had subsided to 20-30 knots, but for our safety we headed back to St. George (again!). I found it exhilarating to sail on the high waves, but the weather was not conducive to doing anything other than sail back to Bermuda. When I asked Dr. Robbie what the agenda was for the day, he replied, “Survive.” I believe that his comment was only partially tongue-in-cheek. In the storm, two flying fish had landed on deck, and although it was sad that they died because of a miscalculation on their part, it was interesting to examine their wing structures. We pulled into St. George around 11:00am. The plan was to stay in harbour for the night and head out again the next morning. Seven people decided they’d had enough and left the ship, Richard included. I was not finished with my experience, however, and decided to stay. So, remaining on deck were the captain and seven crew members, Dr. Robbie and his assistant Claire, myself and one other “trainee,” Eddie. We worked to give the ship a good cleanup, and I moved my things to a better bunk since I had so many to choose from (yay!). In the quiet of the afternoon, Robbie and Eddie taught me how to tie mariners knots, and Dave and Robbie showed me how to chart where we’d been using the GPS coordinates.While we were in harbour, some of us went to the market to pick up treats. Later, the boys on the crew let off steam by swinging off the rigging into the harbour. Claire and I decided to go for a swim as well, as did Robbie and Eddie, and it felt good to be in the water. I had found it tough to be on the water for so many days without be able to go in it! Because we were staying docked for the night, the captain gave us permission to have wine, so between Robbie and me, we put together a cocktail hour with wine, and cheese and crackers, and nuts. Then Trevor, who was feeling much better now the the ship was still, made us a lovely dinner of fried rice with chicken and shrimp and veggies. Amazing how it could be so rough out at sea, and so calm in the harbour. Day 5: I had a fantastic sleep, probably because of the combination all the fresh air, the swim, the wine, calm waters and a quiet, not-moving ship. We headed out at sunrise, admiring the gorgeous sky luminous with colour. Instead of putting the sails up, we motored out because we wanted to get as far out as possible as quickly as possible. It was a beautiful sunny day, breezy, and only slightly swelly. Grey clouds threatened in the distance, but for the time being we were in the clear. We fished out more Sargassum weed and collected more critters. Robbie sank the plankton net down 300 feet, and we were able to observe the different kinds of plankton he collected. Then one of the crew saw fins in the water, and we all ran to the starboard side to watch three large dolphins swimming past the ship! The clouds were moving overhead, rain started to fall, and the water became more choppy. Specimens collected, we headed back to Dockyard, first to refuel and then to the dock, where, reluctantly, I disembarked and waved good-bye to he ship. If you’d like to see photos from the voyage, please visit my Facebook page and check out my Sargasso Sea Voyage album. Have you recently had an experience that was out of your comfort zone, and that gave you an immense feeling of satisfaction?